1914. 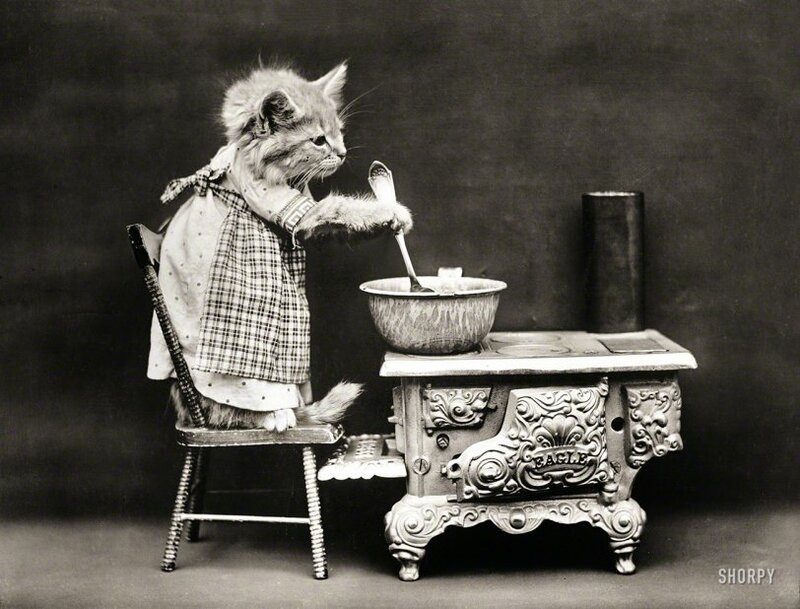 "Cat wearing apron, stirring pot on miniature stove." As seen on the classic cooking show Kitten Kitchen. Photo by Harry W. Frees. View full size. Submitted by rktompsett on Tue, 11/11/2014 - 5:10pm. Yep, it's a toy cast iron stove. My mom had one. I donated it to the Pickford Area Historical Museum, Pickford, Michigan as I did with most of here stuff. Submitted by SLlurker on Tue, 11/11/2014 - 9:48am. They weren't then, but they are now. Still full of interest - keep them coming! Submitted by Zoreo on Mon, 11/10/2014 - 11:39pm. Submitted by elbeaver on Mon, 11/10/2014 - 8:15pm. Submitted by Pdxrailtransit on Mon, 11/10/2014 - 7:14pm. On the stove in the photo (missing in the one on Ebay,) then I wonder if you could have put a can of sterno in the mini-stove, and actually made a little pan of biscuits? Submitted by Vintagetvs on Mon, 11/10/2014 - 7:06pm. I can hardly get my Cats to vacuum, much less cook. Submitted by Jim Page on Mon, 11/10/2014 - 3:24pm. Anyone who listened to the Smothers Brothers comedy albums in the mid 1960s can tell you what flavor of soup that kitty is preparing.
" . . . and Mom made me eat it!" Submitted by Mack W on Mon, 11/10/2014 - 2:13pm. One exactly like this if for sale on eBay. 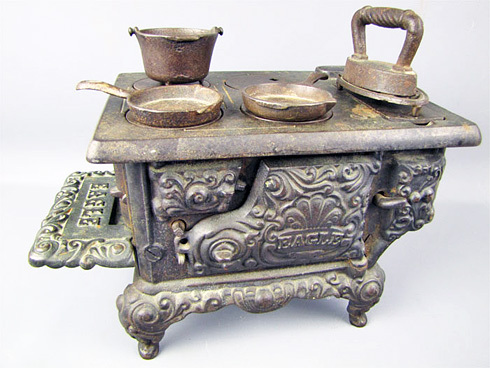 "Lancaster Eagle Miniature Cast Iron Stove w/ Pot Pans." To Play, To Sell, Or Save? Submitted by Solo on Mon, 11/10/2014 - 1:56pm. That stove is a bit too ornate and well executed to be a toy, yet a bit small for a salesman's sample, and it seems to lack coin slots so it's probably not a bank. I'm guessing it's a high-quality toy, but am more than open to correction by my betters. Yaaayy!!! The kitties are back!!!! Submitted by lindab on Mon, 11/10/2014 - 1:53pm. Hope there are more to come. Thanks, Dave. Submitted by Sagitta on Mon, 11/10/2014 - 12:29pm. When you realize that that kitten was probably stuffed, things take a much, much creepier tone. Submitted by switzarch on Mon, 11/10/2014 - 10:48am.